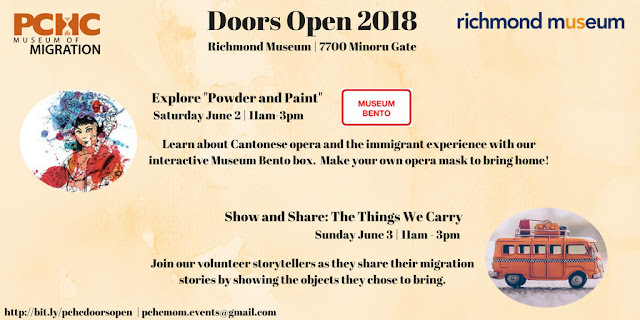 Join PCHC-MoM and Museum Bento on Saturday June 2 and Sunday June 3 at the Richmond Museum for this year’s Doors Open Richmond, a weekend-long, city-wide celebration of heritage, culture and the arts. On Saturday June 2, Museum Bento will be displaying different objects from the Powder and Paint: Cantonese Opera and Immigrant Experience box, developed in conjunction with PCHC-MoM, where you can learn about how Cantonese opera shaped the lives of early Chinese immigrants in Canada. You'll have a chance to explore and interact with the items inside the box, ranging from opera masks and dolls to a model of an opera stage. It will also be engaging in a fun, interactive paper mask-making, where you can create your own unique Cantonese opera mask to bring home! For more information about the Doors Open programme, please click here.